Home→Our Journey→On the Road→Sick on Saturday but better today! Sick on Saturday but better today! Not much to write about – Saturday wasn’t a fun day! Rob woke up in the morning not feeling too well and it went downhill from there. Somewhere along the line, the stomach bug found him – I won’t go into the gory details but it was a pretty tough day for him. And for me watching him! The good news is that it gave me a chance to get caught up on all our blog posts. And the better news is that today (Sunday) he is much improved, eating a little and even taking a short bike ride. Whew, I didn’t want to end up in a doctor’s office like we did last year. Guess it must have been a 24 hour bug! Let’s hope I don’t come down with it. Good thing we had already decided to change our itinerary and stay here longer! I doubt that he would want to drive anywhere today. At least the kids are having fun! There are lots of squirrels and anoles (little lizards) that hang out in the underbrush to keep them amused. Glad you’re feeling better! Stay well! So glad Rob is feeling better. 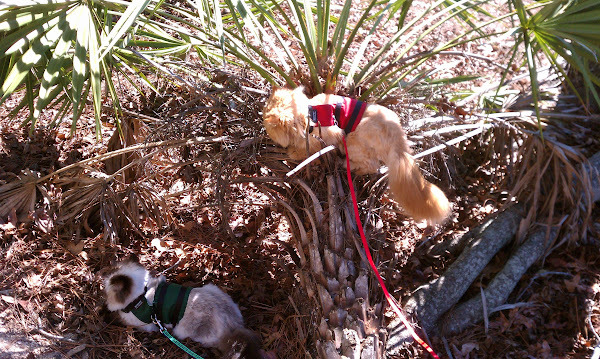 Good for Sparky & Chooey stalking the lizards. They scare me. Glad you’re feeling well, Rob. We’ve been enjoying your blogs;; good job.